A newspaper article detailing Oviedo centennial celebrations at Oviedo High School on March 9, 1979. Senator Richard Bernard Stone was in attendance for the fesitivities and helped to crown Mae King and B. F. Wheeler Jr., manager of the Wheeler Fertilizer Plant, as Queen and King of the Centennial. The article was published in The Oviedo Outlook on March 15, 1979. 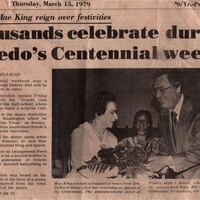 Original newspaper article: "Wheeler, Mae King Reign Over Festivities: Thousands Celebrate Oviedo Centennial." The Oviedo Outlook, March 15, 1979: Private Collection of Sue Blackwood. 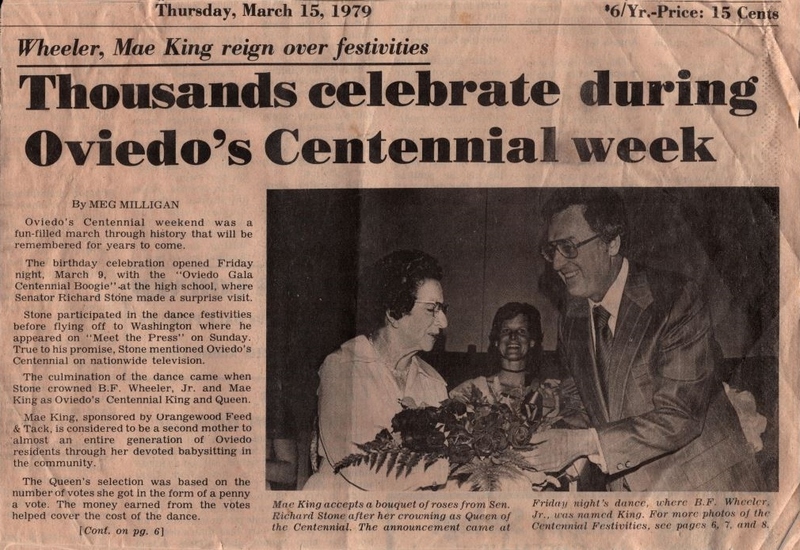 Digital reproduction of original newspaper article: "Wheeler, Mae King Reign Over Festivities: Thousands Celebrate Oviedo Centennial." The Oviedo Outlook, March 15, 1979. Originally created by Meg Milligan and published by The Oviedo Outlook. Oviedo's Centennial weekend was a fun-filled march through history that will be remembered for years to come. The birthday celebration opened Friday night, March 9, with the "Oviedo Gala Centennial Boogie" at the high school, where Senator Richard Stone made a surprise visit. Stone participated in the dance festivities before flying off to Washington where he appeared on "Meet the Press" on Sunday. True to his promise, Stone mentioned Oviedo's Centennial on nationwide television. The culmination of the dance came when Stone crowned B.F. Wheeler, Jr. and Mae King as Oviedo's Centennial King and Queen. Mae King, sponsored by Orangewood Feed & Tack, is considered to be a second mother to almost an entire generation of Oviedo residents through her devoted babysitting in the community. The Queen's selection was based on the number of votes she got in the form of a penny a vote. The money earned from the votes helped cover the cost of the dance. Mae King accepts a bouquet of roses from Sen. Richard Stone after her crowning as Queen of the Centennial. The announcement came at Friday night's dance, where B.F. Wheeler, Jr., was named King. For more photos of the Centennial Festivities, see pages 6, 7, and 8. Milligan, Meg. “Wheeler, Mae King Reign Over Festivities: Thousands Celebrate Oviedo Centennial.” RICHES of Central Florida accessed April 21, 2019, https://richesmi.cah.ucf.edu/omeka/items/show/5207.